THE GALAXY EXPRESS: The Hollywood Elevator Pitch: Useful For Sci-Fi Romance? The Hollywood Elevator Pitch: Useful For Sci-Fi Romance? While on Twitter in the recent past, I noticed Entangled Publishing's Senior Editor Liz Pelletier using a Hollywood elevator-style pitch for two of the publisher's forthcoming releases. * First, I started wondering if I should be tagging more books that way as I blog about them. * Second, would it be an effective strategy to raise visibility for the subgenre as a whole if more authors used this technique? * Third, I started wondering if it has the potential danger of being quickly overused, especially since there are only so many shows like FIREFLY, SUPERNATURAL, and WILD, WILD WEST that would apply to sci-fi romances. I mean, wouldn’t everybody with a space opera or steampunk romance want that kind of buzz? 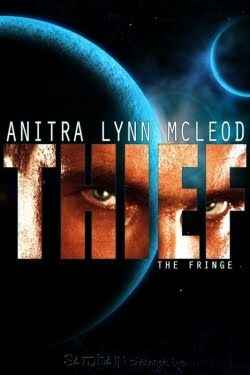 I’ll toss one out off the top of my head: Anitra Lynn McLeod’s THIEF definitely falls into the FIREFLY mode, as I’ve mentioned previously. Hmm, maybe “Firefly meets Ocean’s Eleven” (since it’s a kind of heist tale)? I can definitely see the value of such an approach; however I also worry about pitfalls. Despite my knowledge of genre fare, I don’t often think of science fiction romances in terms of their similarity to films and television shows. Occasionally, a comparison will arise, though. For example, a few books by Linnea Sinclair bring to mind STAR TREK (especially GAMES OF COMMAND); after finishing Cathy Pegau’s RULEBREAKER I immediately thought about the film WORKING GIRL; and as I stated above, THIEF brought FIREFLY to mind. Robert Appleton’s SPARKS IN COSMIC DUST is a futuristic take on the classic Western, THE TREASURE OF THE SIERRA MADRE. But that film came out in 1948! So would referencing that film be an effective pitch, or not? Should military SF romances be mentioned in the same breath as the new BATTLESTAR GALACTICA? But then there are books like HUNTERS (Michelle Marquis & Lindsey Bayer), THE SLIPSTREAM CON (S. Reesa Herberth; MichelleMoore), ENSLAVED BY A VIKING (Delilah Devlin), RICOCHET (Sandra Sookoo), and REPLICANT (Dani Worth; forthcoming), all of which feature bounty hunter heroes and heroines. But what is the equivalent bounty hunter SF film or television show (one that everyone and her mother have heard of, I mean) to compare them to? (Come to think of it, I could use a really good space bounty hunter film or TV show right about now!). This is where the elevator pitch gets frustrating because there doesn’t seem to be enough quality, popular comparison films and shows to go around. Are shows like FARSCAPE too old (in pop culture years) to be effective? And many sci-fi romances are unique or defy easy reduction (e.g., Lisa Paitz Spindler’s THE SPIRAL PATH), which to me is a plus because it means they are delivering something fresh. There’s also the risk of building up expectations, only to have them dashed if the book doesn’t deliver as promised. In other words, if the promised connection is weak. Let’s brainstorm a bit, because there are definite advantages when a story can be easily condensed for marketing purposes, especially in the age of Twitter. It’s also a handy tool when recommending titles. With science fiction romance being a niche subgenre, it can use every strategy available. Authors, do you use these types of comparisons for your books? If so, do you have any evidence that they work (either in terms of sales or contracting books)? Readers, what do you think about them? Do they make you sit up and take notice? Do they help you decide what to purchase/read? Or do they go in one ear and out the other, so to speak? I’m also curious to hear from publishers or those in the know about these things. How does the staff decide which authors get the choice comparisons when launching marketing campaigns, especially if more than one sci-fi romance would qualify? And would you use something like Firefly over and over again if it applies? Or, to come full circle, are publishers simply passing on what authors have pitched to them at the submission stage? In which case, would it behoove all authors to step up their pitch game?